And much more. Please for your next event contact us at "Skindo Brazil Shows & International Shows" with a full service. And all type of entertainment to make your event the best of the best. Welcome “Bem vindo”. 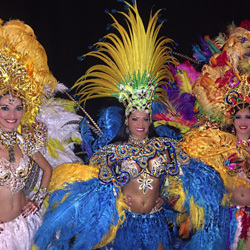 Skindo Brazil Shows is a unique company of mainly Brazilian Performers specializing exclusively in Brazilian music and dance based in Miami,Florida USA. 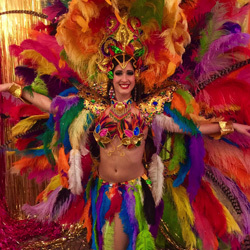 From incredible Musicians, Attractions and stunning captivating Brazilian dancers, we only use highly trained professionals with many years of experience. Our passion is for bringing you the finest in authentic Brazilian entertainment and events management and ensuring your guests have an unforgettable time. 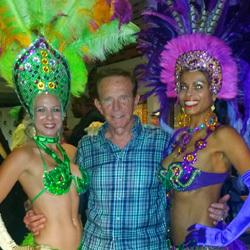 Skindo Brazil Shows have many years of experience performing at Corporate Events, Company functions and Conferences, Award Nights, Company Xmas Parties, Charity Events and private parties. Our team features dancers originally from Brazil who grew up with Samba in their veins performing in Rio’s famous “Sambodromo” Carnival. Our Musicians have also performed with world renowned Brazilian and FL artists as well as theatre and festivals. As we are an independently managed collective you are cutting out the middle man in hiring us for your event, giving you the best price and saving you money to spend on other parts of your event whilst still receiving the highest professional service from a highly managed team. Whatever your event or budget we are here to help you. With our years of experience in planning all kinds of events from corporate events large and small scale to private parties, nightclub launches, theatre events and weddings you can be sure the success of your event’s entertainment is in safe hands. Our dedicated team pride ourselves on going above and beyond your expectations so please contact us to talk about what we can do for your event. Best wishes from all the team at Skindo Brazil Shows. International Brazilian Press Award 2001 / 2003 / 2007 / 2010 / 2011 and 2014 (Amaturo Theater, Broward, Florida). The Largest Samba Choreography with Rio 2 Movie at Guinness Book March 2014, Miami Beach, Florida. Acontece Magazine “ Cultural Merit Award 2007/2009 Miami, Florida.